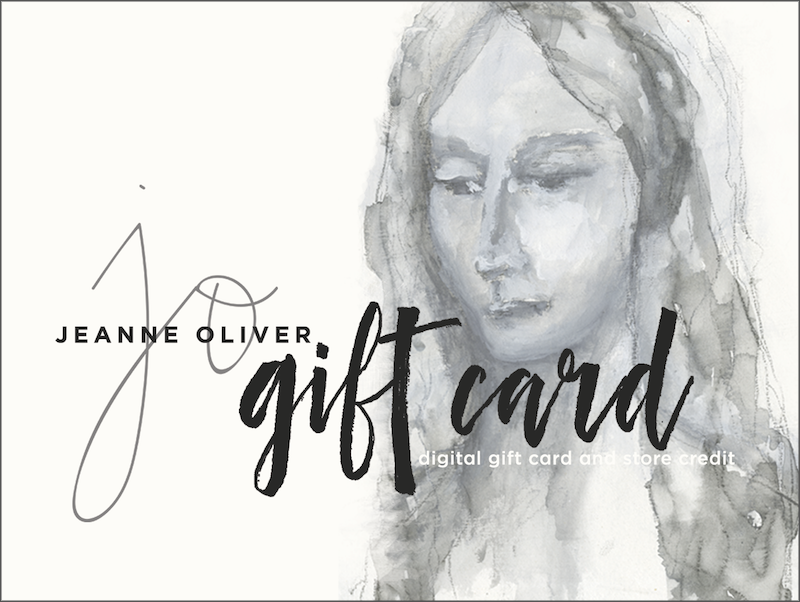 Purchase a digital gift card or store credit for you or someone else here at JeanneOliver.com. Others may even add to your store credit by choosing to gift an amount to your JeanneOliver.com account (email address) at checkout. *Please Read all information at the bottom of this product page. Choose an amount and quantity then click Add to cart. If you choose a quantity greater than one you will send the amount entered to that many people. Read below for all details. Store Credit/Digital Gift Certificates are stored in the persons account here at JeanneOliver.com and can be used for any item in the shop including courses. Store credit will also be applied to shipping (if required). Purchase for yourself or gift to someone else: Login to your JeanneOliver.com account before purchasing (if you do not have one, you will be prompted to create one). Enter the amount and quantity then click Add to cart. You will be prompted to keep the credit for yourself or to gift it to someone else’s e-mail address and type a personal message to them. After the completed purchase: Each recipient will receive email confirmation and store credit in their account. Store credit may be found under the Coupons tab in Your Account. You will see a coupon with the amount and coupon code. You simply click on the coupon and it will add it to your purchase when you are ready to use it. You can always remove the coupon from your purchase before payment if you want to save it for a different purchase. When gifting to someone, make sure you enter their JeanneOliver.com email address on file in the final step after payment. This way it will stay attached to their current JeanneOliver.com account. It is best to confirm the correct email address before gifting the store credit. Confirmation emails are sent with actual clickable coupons as well as with the coupon code that can be copied and pasted. The codes and coupons are unique to each order.